Chrichton's World: Review Criminal (2016): Kevin Costner makes it worth your while. Everything else is a mess! 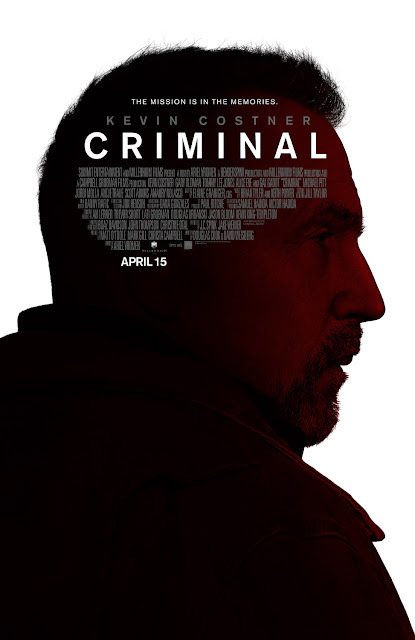 Review Criminal (2016): Kevin Costner makes it worth your while. Everything else is a mess! Honestly I don't know where to begin with this one. With such big names involved and the ludicrous but interesting premise I expected more. Much more. Now it's mostly a boring mess. Except Kevin Costner. He is the only one who delivers. Kevin Costner as Jericho Stewart does what he can to portray the emotionless psychopath who gets memories transplanted of braindead Bill Pope (played by Ryan Reynolds). Say what now? Apparently Tommy Lee Jones can perform miracles these days. But he doesn't seem to be all happy about it. His Dr. Franks has been working on this for 18 years. He successfully managed to transplant or transfer memories from rat to rat. And now when he finally has achieved the impossible he acts like it's nothing to get excited about. Of course this is due to Tommy Lee Jones working on auto pilot and not really giving a damn. Same goes for Gary Oldman. And it really hurts the viewing experience. I really enjoyed Kevin as Jericho especially in the beginning. It was incredibly entertaining and compelling to see him play someone who doesn't know or care about right and wrong. He also seems incapable of having emotions until he gets some personality of Bill Pope in him. Had it been a lesser actor the transition to a more sensitive and caring person with few violent tendencies would not have been believable. Yet Costner achieves this since he understood that he had to do it subtly instead. If he suddenly acted full Bill Pope without a hint of Jericho nobody would have bought it. It's such a shame that everything else is so predictable and boring. Criminal is never thrilling or exciting. I personally was expecting something more like 3 Days to Kill. At least that film was unpretentious fun. I don't know if Ariel Vromen (Danika, The Iceman) tried to provoke thoughts or just wanted to entertain. In either case he fails. As it is now it's only worth it for Kevin Costner.